Creatures of fiction, yet apparently so lucky, it’s Dragons Luck! 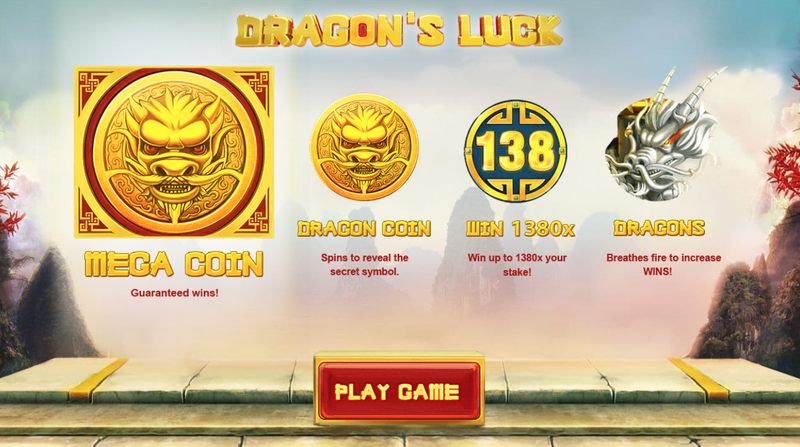 If Chinese-themed slots are your forte, then you should look no further than Dragons Luck from developer Red Tiger Gaming. This 10 reel slot is playable from as little as 20p up to £20 per spin, a margin that is incredibly generous, allowing players of various entry levels to come in and check out this one for themselves! If this happens to be your first online slot rodeo then allow us to give you a quick crash course. You win here by matching as few as 3 symbols in one line. The more you play the more you will ultimately win, which is true in all slots, but here there appears to be more money in it for you given the slots high RTP percentage. Want to learn more about slots online? Be sure to read on below. 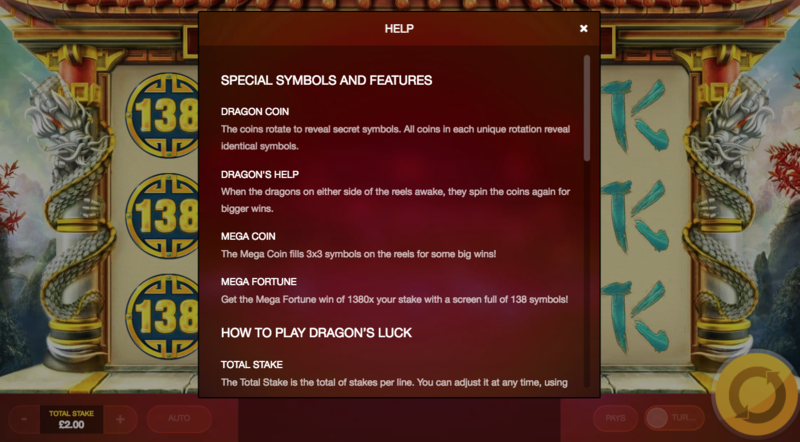 As far as Chinese themed slots go, Dragons Luck is up there with some of the very best. Red Tiger Gaming have outdone themselves yet again, having created a slot that a lot of players can pick up simply because of how diverse the pay margins happen to be at the start of the game. Gold Coin: The gold coin symbol here is one of the more versatile symbols on the board. Matching this symbol will turn a lot of symbols into the same symbol in an instant! This means that you will sweep the board clean and will come away with a very handsome pay-out as a result. 138 Symbol: Looking for alternate routes to get the big scores? Look out for the 138 symbol, matching 10 of these symbols in the same row will pay-out 3,888x your initial stake! The likelihood of this happening on the first spin is rare, so you might have to play for a couple of hours to find this bonus! Join and spin today for the best promotions and bonuses! Dragon’s Luck from Red Tiger Gaming is one of the more extensive experiences from the developer, a game that pretty much anyone can pick up and master, which is why this slot is so fun to play in its own right. 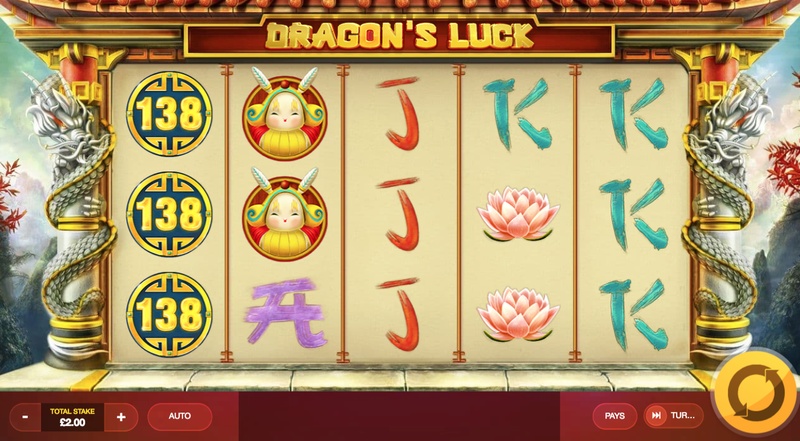 If you are looking for a very fun slot to play that has a great theme permeating throughout, then you’ll find that Dragon’s Luck is the one for you! Or play our other fun spin slot games!